David Forbes Martyn, physicist, was born on 27 June 1906 at Cambuslang, Lanarkshire, Scotland, son of Harry Somerville Martyn, ophthalmic surgeon, and his wife Elizabeth Craig Allan, nÃ©e Thom. David attended Plymouth College, England, and Allan Glen’s School, Glasgow, which was noted for its commitment to the teaching of science. In 1923, he entered the Royal College of Science, London, to study physics. He graduated with First-Class Honours (BSc, University of London, 1926) and was made an associate of the college. While registered as an external student of the University of London, Martyn took up a research scholarship at the University of Glasgow in 1926. He investigated the triode oscillator circuit, both experimentally and theoretically, successfully tracing its puzzling instability to a hitherto neglected flow of current to the valve’s grid. For this work he was awarded a PhD by the University of London in 1928. He remained at Glasgow, supported by a William Houldsworth research studentship, until mid-1929 when he was one of four research officers selected to join the Australian Radio Research Board (RRB), established under the Council for Scientific and Industrial Research. This appointment transformed his career. Martyn’s early work with CSIR was largely experimental, but it soon became evident that his real strength lay in theory. Initially, he was attached to the RRB group which worked in TH Laby’s laboratory at the University of Melbourne. There, with RO Cherry, he investigated the fading of signals from local radio stations. In 1932, he transferred to the RRB’s other group in Sir John Madsen’s electrical-engineering laboratory at the University of Sydney. That year Martyn made substantial technical contributions to a Federal government inquiry into Australia’s broadcasting services. While surveying available data on the propagation of medium waves in the ionosphere, Martyn developed a useful theorem, now named after him, by which mathematical expressions relating to waves incident obliquely on the ionosphere could be obtained from those for vertical incidence. With VA Bailey, he also formulated a theory to account for the ‘Luxembourg effect’, the modulation of a passing radio signal by an intervening powerful source. Their analysis depended on the novel idea that the mean velocity of the electrons in a region of the ionosphere, and hence the absorbing power of the ionosphere in that region, could be significantly affected by a powerful radio signal passing through it. The theory quickly won wide acceptance. Martyn’s work evolved into a more general investigation of waves reflected from the ionosphere, leading to a study of the properties of the ionosphere itself. In 1936, with OO Pulley, he published an important paper on conditions in the upper atmosphere. Perhaps their most striking conclusion was that the temperature of the F2 layer of the ionosphere was 1 000 °C or more. Soon afterwards, in collaboration with GH Munro and JH Piddington, Martyn perfected a ‘pulse-phase’ technique that yielded continuous data on the polarisation of reflected radio waves and hence on changes taking place in the layers of the ionosphere from which they were being reflectedâ€”data that he was able to use to resolve a debate over which dispersion formula applied in the case of ionospheric reflections. He also became interested in the connections between ionospheric disturbances and solar phenomena. As early as 1930, in an unpublished RRB report, Martyn had pointed out the advantages of using ultra-high frequencies for long-distance communications and for obtaining information about objects from which the beam was reflected. During a visit to Britain in 1936, he at once guessed the nature of secret research on radio-location being carried out by Sir Robert Watson-Watt and his colleagues. On his return, he successfully urged that UHF work be initiated in Australia. He was the natural choice when, in February 1939, the British government invited Australia and the other dominions each to send a scientist to England to learn the secrets of what became known as radar. After he came back to Australia, he was appointed in September head of the new radiophysics laboratory, established by CSIR at the University of Sydney to contribute to this vital new technology. Martyn’s period in this post was an unhappy one. Although his letter of appointment accorded him the status of Chief of a CSIR Division, he was never given full control of his laboratory’s affairs, but instead had to share responsibility with his former mentor Madsen, Chairman of the Radiophysics Advisory Board. This arrangement sometimes led to difficulties. Martyn also alienated many of the officials with whom he had to deal. Moreover, a proposed overseas trip had to be abandoned when the security service reported unfavourably on his relationship with Ella Horne, a German woman he had indiscreetly befriended. His duties were more and more assumed by Sir Frederick White, who, in October 1941, was placed in sole administrative control of the laboratory. The office of Chief was temporarily abolished and Martyn’s position downgraded. In May 1942, he was seconded to the army to head an operational research group with special responsibility for problems associated with radar. The group’s study of ‘super-refraction’ of radio waves in the atmosphere brought about significant improvements in operational efficiency. At the district registrar’s office, Paddington, on 12 May 1944 Martyn married Margot Adams, a 30-year-old secretary; they were to remain childless. He was transferred in December to the Commonwealth Observatory, Mount Stromlo, Canberra, and resumed his theoretical studies of the ionosphere. In 1956, he was appointed officer-in-charge of the RRB station at Camden, New South Wales. Two years later it became the independent upper atmosphere section, specially created for him within the Commonwealth Scientific and Industrial Research Organisation. Soon after arriving at Mount Stromlo, Martyn had formulated a theory of temperature radiation from the sun. He predicted radiation from the corona corresponding to a black body at 1 000 000 °C at wavelengths of about 1 metre, and also limb brightening at centimetre wavelengths. Both forecasts were rapidly confirmed. During the following decade Martyn made a series of fundamental contributions to knowledge of the ionosphere and of the way in which changes occurring there are linked with changes in the earth’s magnetic field. His starting point was the identification of large solar and lunar tides in the upper atmosphere. He developed a modified ‘dynamo’ theory, according to which horizontal winds due to these tides gave rise to motions of electrons along the lines of the earth’s magnetic field. These motions had a vertical component that could, he suggested, account for the observed semi-diurnal variations in both the ionisation of the upper atmosphere and the earth’s magnetic field itself. When it was argued that the conductivity of the upper atmosphere appeared to be too low to fit the requirements of the theory, Martyn proposed a mechanism to overcome this objection, one that he and WG Baker showed was in full quantitative agreement with the phenomena. They also showed that there should be a narrow zone of still greater ionospheric conductivity near the magnetic equator that should give rise to an intense equatorial electrojet, the existence of which would explain the recently discovered strong enhancement of the daily magnetic variations in equatorial regions. Such an electrojet was, at about the same time, observed directly using a rocket-borne magnetometer. As a result of this work, the dynamo theory came to be regarded as securely established. In 1936, the University of London had conferred a DSc on Martyn for his researches on radio propagation. 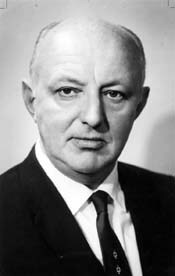 The importance of his work on the ionosphere was recognised by the award of the (Sir Thomas) Lyle medal (1947) of the Australian National Research Council, the Sidey medal (1947) of the Royal Society of New Zealand, the Walter Burfitt prize and medal (1950) of the Royal Society of New South Wales, and the Charles Chree Medal (1955) of the Physical Society, London. Martyn was elected a fellow of the Royal Society of London in 1950. With (Sir) Mark Oliphant, Martyn provided the driving force behind the formation of the Australian Academy of Science in 1954. He took on most of the negotiations with the Australian National Research Council, especially concerning the transfer to the academy of responsibility for maintaining Australia’s international scientific connexions. He also played a pivotal role in drafting the academy’s statutes and rules, and in obtaining its royal charter. The academy’s first secretary (physical sciences), he was its president in 1969-70. In his later years Martyn became deeply involved in international scientific affairs, where he displayed the same diplomatic skills as he had done in the formative stages of the Australian Academy of Science. He was especially active in the International Radio Science Union (URSI) and the Committee on Space Research. He was at different times president of two URSI commissions, on radio astronomy and on the ionosphere, and vice-president (1950-54) of URSI itself. Martyn was instrumental in persuading the union to hold its 1952 general assembly in Australia. He was a principal organiser of Australia’s contribution to the 1957-58 International Geophysical Year. From 1962 until his death he chaired the United Nations Scientific and Technical Committee for the Peaceful Uses of Outer Space, playing a major part in framing the Treaty on Outer Space. Martyn was a complex man, touchy and secretive, yet excellent company and endowed with a sense of humour. A connoisseur of wine, food and cigars, he was also an enthusiastic trout fisherman. He never lost his Scottish accent. Perhaps his greatest strength, in both his science and his committee-work, was his mastery of detail. In his international activities he could be extraordinarily patient and tactful, but he never forgave White or EG Bowen (White’s successor as Chief of the radiophysics laboratory) for the wrongs he believed they had done him. He successfully blocked the election of both men to the Royal Society for many years and took evident pleasure in demonstrating the statistical inadequacies of work on rainfall records published by Bowen in the 1950s. Late in life, Martyn became deeply concerned about the degradation of the environment, and his fear of impending disaster contributed to his depressed state of mind at the time of his death on 5 March 1970. Evans WF, 1973, History of the Radio Research Board, 1926-1945, Melbourne. Schedvin CB, 1987, Shaping Science and Industry, Sydney. Home RW, Kohlstedt SG, 1991, International Science and National Scientific Identity, Dordrecht, Netherlands, pp.181-204. Massey HSW, 1971, ‘David Forbes Martyn. 1906-1970â€², Biographical Memoirs of Fellows of the Royal Society, 17: 497-510.